"It's been a pleasure to work with St. Francis Landscape & Gardening. Pat is knowledgable, attentive and professional. Even when we haven't called him, he comes by to make sure everything is going well. His crews are prompt, reliable, and responsive when we have questions. This has been by far our best landscaping experience." 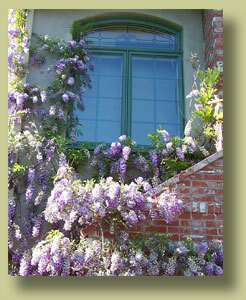 St. Francis Landscape & Gardening is an award-winning, local San Luis Obispo business. It was founded by Pat Connelly in 1979. Pat studied plant science and landscape design at Cal Poly, and later earned his contractor license. He established St. Francis Landscape to offer people quality care for their home or commercial landscape with an emphasis on superior customer service. After more than 25 years in business St. Francis Landscape is still known for providing a personal touch on high-quality work. Pat is involved in his landscape and maintenance accounts, ensuring the quality on which he built his reputation. His landscape installations have won several Obispo Beautiful awards. St. Francis Landscape also specializes in designing water conservation landscapes. St. Francis Landscape is a member of the California Landscape Contractors Association (CLCA), of which Pat has served on the board of directors for the San Luis Obispo chapter - as chapter president and as chapter officer. "Pat has talent, integrity and he's a joy to work with. He does more than what he's hired to do, which means he's also a great value." "Pat did a great job coordinating the hard- and soft-scape at our home. As absentee owners we are always concerned about how a job will be performed without us there. Pat not only coordinated the job, but went above and beyond our contractual agreement to create a fabulous result. It's nice to know we can still trust people to do things right."